Ground Transport – So how do we get around once we get off the plane? Heathrow Airport to the hotel? the end of the walk in Kemble back to London? and hopefully all around London once we return from the walk’s end? England has an extensive public transportation system and TFL (Transport for London) is a great resource. The site offers any number of options of getting from here to there along with timetables and costs. Just plug in your location, your destination and a preferred timeframe and presto ... you've got an itinerary with detailed directions. I had to figure out (or remember) some of the jargon … DLR (Docklands Light Rail), the Tube (underground), local bus vs. coach, express train vs. national rail, but there’s lots of info available to navigate through it all. As luck would have it, our Capital One credit card qualifies. I called them just to make sure. Yup, we’re good to go … just ‘tap, pay and go’. How convenient! I originally determined that an Oyster pay-as-you-go card was the most convenient and least expensive option for travel around London. I later learned that if I bought a regular Oyster card vs. Visitor card, I could claim a £5 refund at the end of our trip. Recently, however I discovered ‘contactless payment’ and how it works in the UK. Chipped credit cards that also display a soundwave icon can be used to pay for ground transport, as well as many other items and services in England. Which way? There are pros and cons for starting at the headwaters near Kemble and walking to London or vice versa. We decided to begin our trek in London for several reasons. First and foremost, it’ll be easier to get to a hotel and settled in upon our arrival in London, rather than immediately taking a train to Kemble. Second, the closer we are to London, the more frequent opportunities there will be to stop and rest if we need it. Towards the end of the route, the daily mileage increases between villages and we’ll hopefully be more acclimated to longer distances as the days progress. 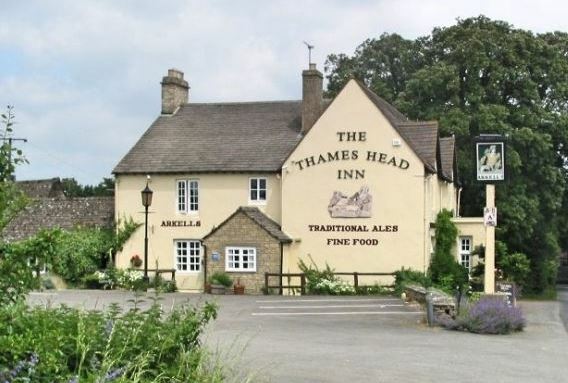 Accommodations - There are pubs, B&Bs, hostels and hotels strategically located along the entire route from London to Kemble. Towards the end of the route, the villages are further apart, but still reasonably placed for a day’s walk. No camping on this trip … we plan to unload our packs, rest our dogs, drink ale in the evenings and eat pub food. Since we aren’t sure just where we’ll be at the end of each day, I only made hotel reservations for the first couple of nights’ accommodation. We’ll figure out the rest as we go, but there are some fun sounding pubs and hotels we might want to try … the Red Lion, the Thames Head Inn, the Hart & Garter, the White Hart in Twickenham. Doesn't this look like an appealing place to drink a pint and spend the night? What to bring? As previously noted, since we’ll be on the go and walking to a different location every night, we’re opting to take only a backpack each eliminating the worry of having luggage transported from one location to the next. We agreed to keep each backpack weight to less than 20# … for comfort, simplicity and ease of walking. Considering my empty Osprey Aura pack weighs 4.1# and my laptop weighs about 3.5#, it doesn’t leave room for many clothes and personal necessities … like a little make-up, a skirt (in case we eat somewhere fancy-schmancy), a journal and all those other necessities like a toothbrush, paste and floss. Getting it all together, packing it up and hoping it all weighs less than 20 pounds. Checking out the average temperatures for London in September seemed prudent. Sunrise/sunset Sept 1 – 0613-1947 – 13.34 daylight hours; Sunrise/sunset Oct 1 - 0700-1836 – 11.33 daylight hours. We lose two hours of daylight during the month we’re there. We chatted constantly about what to bring and then made several purchases of lightweight, versatile layers of clothing. Some items, like long sleeved tees, I was able to purchase at our local thrift shop, but for other items, we relied on REI for the quality and the guarantees of performance … good walking shoes, rain pants and warm, lightweight base layers, for instance. A waist pack fit snugly in front of my backpack and offered easy access to my camera and other frequently used items I'd like handy while walking. I also decided to take a small waist pack for easy access to things like my camera, batteries, the guide, chapstick, etc. I can wear it in front and the backpack fits securely around it and covers the back clasp, so I don’t have to worry about someone snatching it from me. This particular waist pack also converts to a shoulder bag when I'm not wearing my backpack. Speaking of cameras, I debated which one to take and finally decided on my old standby Canon SX720HS. It's a point and shoot with some manual options, fits into my pocket (or my waist pack, in this case), has 40X optical zoom ... and it doesn't weigh much. Of course, adding the charger and the rechargeable batteries had to be considered, but it was still smaller and less bulky to tote around. Packing was another challenge. Once we figured out what to take, then we needed to decide how to pack everything. Our backpacks provide lots of nooks, crannies and little compartments for stowing stuff. Of course, remembering where everything is located becomes another issue. Rain gear should be easily accessible. Less used items (like that skirt and make-up, I insist upon taking) will be packed first. We packed and unpacked and repacked and unpacked. We had list upon list and then a list of our lists to make sure nothing was forgotten. We’ll know when we get there how successful we were. For specifics as to clothing, like just how many pair of underwear and socks we’re taking … check out David’s next BV. I did sneak in a few things not on his list, but don’t snitch on me. An interesting side note … we thought it might be prudent to load the packs fully and give them a try to make sure we were happy with the fit, comfort and the weight. On one of our morning walks around the golf course, we wore our loaded packs. Suffice it to say, we received several strange looks and Security might have mistaken us as homeless folks had he not recognized us. By the time you read this, we’ll have begun our walk. Can’t wait to share all the details with you, so check back frequently to monitor our progress.